Rocky Lake is on P. 39, grid I-9 of the Oklahoma DeLorme Atlas and Gazetteer, and page 140 of the “Lakes of Oklahoma” guide by the Oklahoma Water Resources Board. It is 347 acres with an 8 mile long shoreline. It is also called Hobart Lake, as it is a reservoir for that town. Hobart is another of those Oklahoma towns that sprang into existence overnight following the opening of reservation lands for white settlement. It has been part of the KCA Reservation (Kiowa, Comanche, and Apache). At the opening of the reservation, settlers drew lots of free Indian land. On August 6, 1901, 2,350 people descended upon the land, making it one of the smaller land rushes. They first settled in tents, giving the area the name of Ragtown. The town’s tents were gradually replaced by wood structures, and by 1903, the town had electricity and an ice plant. The name was later changed to honor Garret Hobart, 24th Vice President of the United States. Like many Oklahoma towns, its population reached a peak in 1950, and has since been in a steady decline. 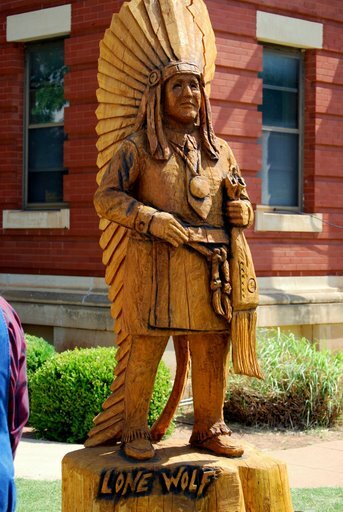 Chief Lone Wolf the Younger (1843-1923) was a Kiowa Chief depicted by a statue on the lawn of the Kiowa County Courthouse. It was carved from an elm tree by chainsaw carver Clayton Coss. Before paddling Rocky Lake, it's important to understand how this area was settled. In October, 1867, 5000 Indians met U.S. officials at Medicine Lodge Creek in Southern Kansas to ratify the Treaty of Medicine Lodge. Kiowa and Comanche tribes were represented, but the Apaches refused to attend. The U.S. would set apart 2.9 million acres of land for the KCA Reservation, “for the absolute and undisturbed use and occupation of the Tribes.” In exchange for the 2.9 million acres, the tribes would cede 93 million acres, but no more lands could be ceded without signatures from three-fourths of all male adults living on the reservation. In 1892, the Jerome Commission was one of 15 such commissions working to move Native Americans off the lands they had been forced to move to in the Indian Territories, and promised total dominion over. The objective was to give lands already promised to the tribes to settlers. The justifications for this action were such things as “it was God’s will,” or “the Indians didn’t know how to farm, so weren’t making proper use of the lands.” The Jerome Commission proposed changing the Medicine Lodge Treaty, but the tribes unanimously opposed reallotment, or the selling of their land, as well as any further railroad rights-of-way across their lands. They wanted their lands left undisturbed as guaranteed by the treaty. The Commission argued that the tribes did not need 2.9 million acres, but only 500,000 acres, and the remaining 2 1/2 million acres would be opened for settlers. In spite of much debating by both sides, nothing was resolved, so the Jerome Commission decided on a deception by returning to Congress and assuring them that they had the required signatures of three-fourths of the Indians needed to set aside the provisions of the Medicine Lodge Treaty. From a distance, Rocky Lake looks almost idyllic. By July 24, 190l, over 150,000 people had registered for the lottery drawing for the 11,638 homestead sites on the reservation lands. Of the 500,000 acres the KCA were forced to accept, 480,000 acres had been set aside for common use, which meant that farmers and ranchers were free to use 96% of the Indian lands for grazing cattle. By 1906, that too had been opened for white settlement. By the end of the “allotment era,“ their 2.9 million acres had been reduced to 3,000 acres. Following his defeat in all the courts, Lone Wolf returned to his allotment on the reservation, where he remained with his family until his death in 1923. It was not until 1955 that the Indian Claims Court finally ruled in the KCA’s favor, and they were paid $2 million for the lands they could never reclaim. The bottom line was the tribes had given up 93,000,000 acres of land for the eventual $2 million, or 2 cents per acre.